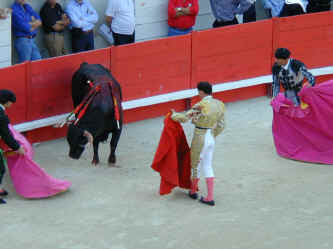 For stopping the blood sport, bullfighting! It is a remarkable accomplishment in light of its long cultural acceptance in Spain! It's hardly a "fight" since there are people in the ring stabbing the bull with lances, debilitating him until the matador finally thrusts his sword into the bull's neck, killing the helpless, disabled animal. This "sport" is the living definition of bully. Rock on, Catalonia, for becoming a beacon of more humane behavior in our world!